You’re one quick scroll-down away from seeing a pitch-perfect electrical engineering resume example. Better yet—you’re a five-minute read away from learning how to create one yourself! Crafting a professional electrical engineer resume will be decisive for your future career. IEEE describes electrical engineering job trends in 2018 with one word: high. High growth, high salaries, high demand, and, at the same time, extremely high competition. The good news is, you are going to beat all your competitors. Just follow the proven resume writing advice I’m about to share with you. An electrical engineering resume sample better than 9 out of 10 other resumes. How to write an electrical engineer resume even if you have no experience. Tips and examples of how to put skills and achievements on an electrical engineering resume. How to describe your experience on a resume for electrical engineer positions to get any job you want. 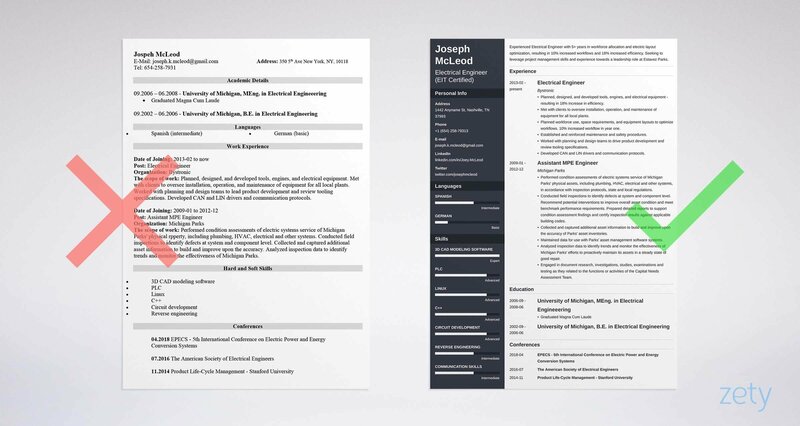 Here’s an electrical engineering resume sample made with our resume builder. What’s the Best Electrical Engineering Resume Format? Before you start writing a resume for electrical engineer jobs, you need to pick a good resume format. It will help recruiters find the most important details about you in a flash. Long story short—pick the respected, elegant reverse-chronological resume format. Recruiters are familiar with it, plus, it helps you highlight your best assets. Here’s what sections to include in an electrical engineering rev-chron resume format. Pro Tip: Once you finish crafting your electrical engineer resume, save it in PDF so that your resume layout stays intact. But make sure to read the job ad carefully. Some employers don’t accept PDF files—if such is the case, send your electrical engineer resume in DOC. Electrical Engineer Resume Summary or Objective? That’s how much time, on average, recruiters spend scanning each resume they receive. You can make them read your electrical engineering resume in full. How? Start your EE resume with either a resume summary or resume objective—a brief paragraph that explains why you’re the perfect electrical engineer for the job. Think about it as a trailer for your job application. If it’s interesting for the hiring manager, they’ll want to read on. If you’re an experienced electrical engineer writing a senior electrical engineer resume, use a resume summary. Highlight your career progress and skills set. Writing a fresher electrical engineering resume? Go for a resume objective. Show what you’ve already learned and what you can offer your employer. In the headline of an electrical engineering resume, don’t write about what you want out of the job. Focus on what you have to offer instead. Check out these sample electrical engineering objectives and summaries to see what I mean. 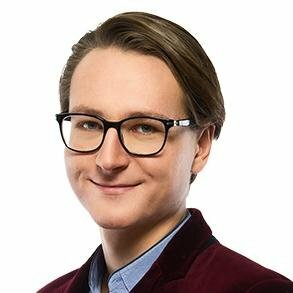 Technical-minded, EIT Certified electrical engineering graduate looking for a junior Electrical Engineer position at Entech Engineering. Looking to leverage my working knowledge of AutoCAD, Microstation, and Revit, and experience in electronic troubleshooting activities to help you with your upcoming projects. I’ve got what it takes to perform well in this job and I can help you with your challenges. I am a recent electrical engineering graduate and I would like to get a junior electrical engineer job with a company where I could further develop my electrical knowledge by hands-on experience. Because it reads like something along the lines of: I want any job so I can learn more. You won’t land your next job if you don’t show what you’ve got to offer. Now, let’s have a look at two very different professional summaries for an electrical engineering resume. Detailed-oriented senior electrical engineer with 10+ years of experience with construction and industrial electrical installations. Upgraded XYZ’s old test system to a new system running on C++, cutting average testing time by 58%. Seeking to leverage my knowledge of and expertise in industrial control, circuit management, and power distribution to help ABC Corp. maximize productivity and quality of electrical operations. Traveling as needed. Experienced (over 10 years) MEP electrical engineer. Have designed, developed, installed, and tested electrical and mechanical equipment for clients in diverse industries. Have worked with both business and individual clients. Do you think you could be any more generic? “Clients in diverse industries? !” What industries exactly? The biggest problem with this summary is that it fails to achieve its main purpose—introduce the candidate to the employer in a brief but comprehensive way. Pro Tip: In every resume objective or summary for electrical engineering positions, address the company by name and indicate the position you’re targeting. Yup—that means you cannot send an identical resume for every application. And that’s the point. Personalize every resume you send! How to Describe Your Electrical Engineering Experience? What matters most for recruiters is your work experience. This section of your electrical engineering resume gets the most attention. If you want to land that dream job, your resume’s work experience section has to be perfect. Don’t talk only about your duties and responsibilities. Highlight your achievements and accomplishments instead. Follow it with your previous position and the one before that, and so on. In each entry, include your position name, the company, and the dates worked. Quantify whenever possible. Don’t say you “significantly reduced manufacturing time.” Say how much exactly. Numbers pop! Coordinated the preparation and implementation of executions plans in various work locations. Provided guidance, training, and development of the field electrical and instrumentation personnel. Fully trained 20+ employees. Reviewed and corrected site drawings, redlined, and produced hand-drawn field sketches to meet industry standards. Key achievement: Redesigned machine arrangements for improved efficiency. Increased production efficiency by 35% over previous arrangement. Handling of code variances and technical deviations. Creating power systems and area classifications. The right electrical engineering resume sample showcases quantifiable achievements and specific duties. Plus, it’s packed full of action words. Pro Tip: The common advice is to keep your resume one-page. But you know the old saying: the most expensive wire is the one cut short. The same goes for your electrical engineering resume. 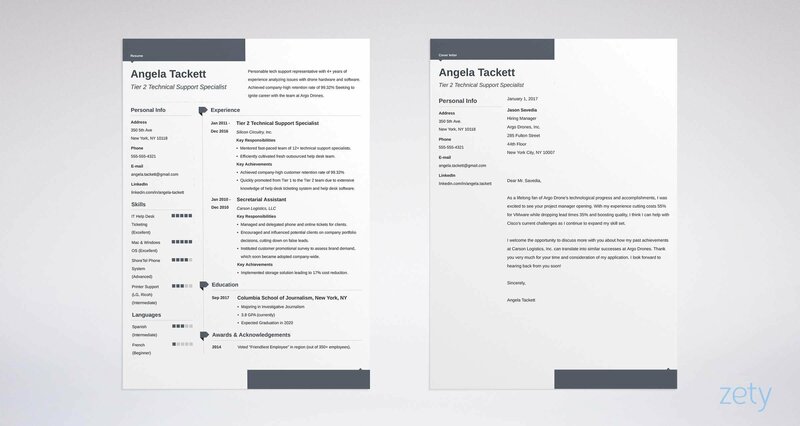 It’s better to have a two-page resume than to omit any important information. Is Your Education Section Underpowered? It Might Be. List only your highest degree of education (the only exception is if you’ve completed graduate studies—in this case, include your Bachelor’s too). If you’ve got more than 6 months of working experience, skip your GPA. Also, don’t include it if it’s lower than 3.5. It could do you more harm than good. Things get a bit more tricky if you’re writing a fresher electrical engineering resume, an undergraduate EE resume, or any other entry-level electrical engineering resume. If this is your case, elaborate on your education a bit more. Pro Tip: Eyeing graduation and unsure what should your next career step be? Check out this report and see the highest-paying industries for electrical engineering graduates. Need an Electrical Engineering Internship Resume with no Experience to List? The rules for writing an electrical engineering internship resume or an electrical engineering student resume are slightly different from general resume writing principles. The first thing you should do is to put your education section above the work experience section. If you’re an electrical engineering student, your education is probably your best asset. Lead with it and put it right under your resume objective. As explained in the section above, provide additional info about your academic experience. What about your experience section? Should you omit it altogether? You might not have full-time professional experience, but if you’re an electrical engineer student, any experience can dazzle recruiters. It doesn’t have to be strictly related to electrical engineering. Check out the sample below. Completed several client projects including small consulting and engineering research jobs. Assisted with design of simple MEP installations. Yup, that’ll do the trick. You don’t need fancy achievements at this point of your career. But recruiters want to know you’re willing to constantly learn and self-develop. That’s one of the most crucial qualities they seek in prospective interns. At the end of the day, your skills are what’s of most value to employers. But that doesn’t mean your electrical engineer resume should feature a list of 20+ skills listed in whatever order you see fit. Don’t just put the names of your EE skills. Provide evidence that shows your level of proficiency. Pro Tip: Apart from the skills section, you should also mention your best electrical engineering skills throughout your work experience section and refer to one or two of the most relevant ones in your electrical engineer resume objective or summary. Check out our list of the most desired electrical engineering resume skills. How to Add Other Sections for an Effective EE Resume? You’ve got your career objective or a professional summary at the top of your electrical engineering resume, you’ve described your experience, education, and skills. That’s a really decent resume you’ve got there. Want to take it from decent to the best electrical engineering resume on the recruiter’s desk? How About an Electrical Engineering Cover Letter? Yes, you do need a cover letter in 2018. Because almost half of the recruiters won’t even bother to cast a glance at your resume if there’s no electrical engineer cover letter attached. Plus, a well-written cover letter can be used to your massive advantage. Think about writing an electrical engineering internship resume or a student resume for electrical engineering jobs. Daunting, right? Here comes your savior: the cover letter. In it, you can showcase your creativity and explain why you’re interested in electrical engineering career. But it’s not only freshers who should include a cover letter in their application. It doesn’t matter if you’ve got 1 year experience, if you’re a mid level electrical engineer, or a seasoned professional in marine electrical engineering. Attaching a cover letter doubles your chances of getting hired. There’s no arguing with hard numbers, is there? Pro Tip: Once you send your electrical engineer resume and a cover letter—follow up. A nudge by phone, email, or in person can prove your follow-through ability! Open your electrical engineer resume with a resume career objective or a resume summary. Say what makes you a great candidate and make an offer. Match your skills list with the skills required in the job ad. Got any questions? Need further help? Want to chat about writing your resume? That’s great cause I can’t wait to hear your thoughts! Drop me a line in the comments and I’ll make sure to get back to you right off!